I toyed with the idea of giving Elnor an arm that shoots knives or something, but chickened out as I felt it was a little too silly. 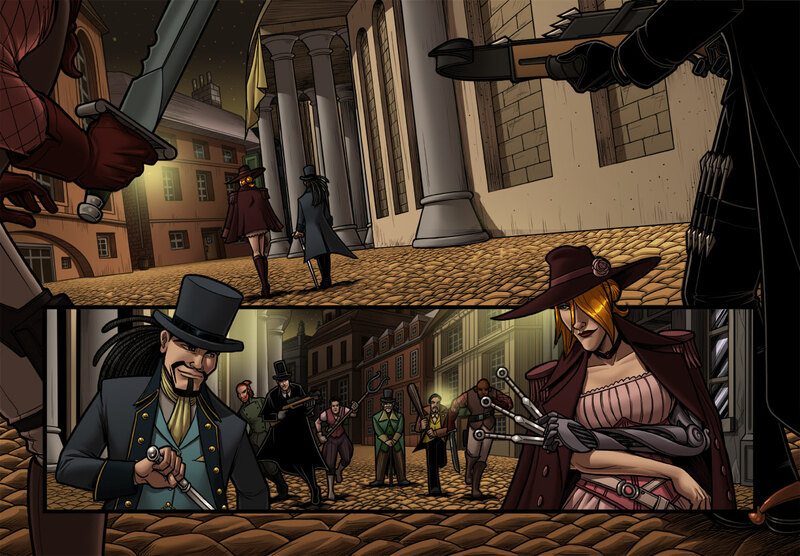 Also, one has to admire Jibb’s (top hat/crossbow guy) perseverance. Apparently he comes from the Wile E. Coyote school of pursuit. Come back next week for the last ever page of Impure Blood! Follow us on Facebook, Twitter and Instagram, if you’d like a reminder. Nice! So are all of our leading ladies getting sweet new hats? That’s like, Carmen Sandiego level of cool-hatness, Elnor. Oh, hey, her arm’s different too. You got me. If Dara ever wore a hat, I probably would have given her a new one too. I’ve said it before and I’ll say it again: A Caspian/Roan buddy comedy road trip story needs to happen. Sounds like a pretty great spin off to me. Though it has a lot of competition with a Mac-centric spin off.